Office 365 and Google Apps are two perfect mainstream examples of the cloud computing trend for small businesses; for an inexpensive monthly fee, you can get full access to and use of Office applications that used to cost a few hundred dollars to purchase. And, since these apps are being powered by the cloud provider, you don’t need an expensive desktop with lots of power to use them – just a simple Internet connection will do on a laptop, desktop or tablet. Cloud computing, or “going to the cloud,” is very similar to the concept of paying for electricity as a utility rather than purchasing and running your own generator to power your home or office. Public utilities shoulder the burden of generating and delivering electricity and can provide a cheap, reliable, “pay as you go” service to anyone wanting water or power. Similarly, with cloud computing, the cost of hosting, securing and delivering network services (like Office) is owned by the utility company (in this case, Microsoft). The simple fact is, cloud computing is NOT a good fit for every company, and if you don’t get all the facts or fully understand the pros and cons, you can end up making some VERY poor and expensive decisions that you’ll deeply regret later. You need to consider the reliability of your Internet connection, what type of help-desk support you want, security, what other applications (accounting, CRM, line-of-business applications, etc.) you need and which devices (scanners, printers, iPads) you need to use. 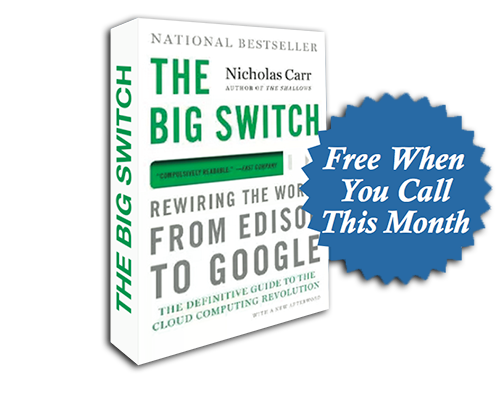 Plus, if you call us during the month of July to schedule this assessment, we’ll send you a FREE copy of the national best-selling book The Big Switch by Nicholas Carr. This book talks about the massive technological revolution that is happening right now and what it means to businesses like yours. Our Free Assessment Will Give You The Answers You’re Looking For.